sciencemug sip science & laugh: HAPPY B-DAY LORD 'WHY THE SKY IS BLUE' RAYLEIGH! HAPPY B-DAY LORD 'WHY THE SKY IS BLUE' RAYLEIGH! But maybe it's not like that, maybe it's just that you, human beings, you all are poets, in the flourishing, clumsy, bizarre depth of your chests. So when your self-consciousness emerged along the puzzling misty path of evolution and your eyes were fuelled for the first time by this new prodigious gift from semi-casuality, you, human beings, you poets and chanters, you simply decided that your sky is blue, 'cause blue fits it. Not too strong, as a colour, to burden the spectacle of it, not too dull to lessen its simple, pure, absolute majesty. 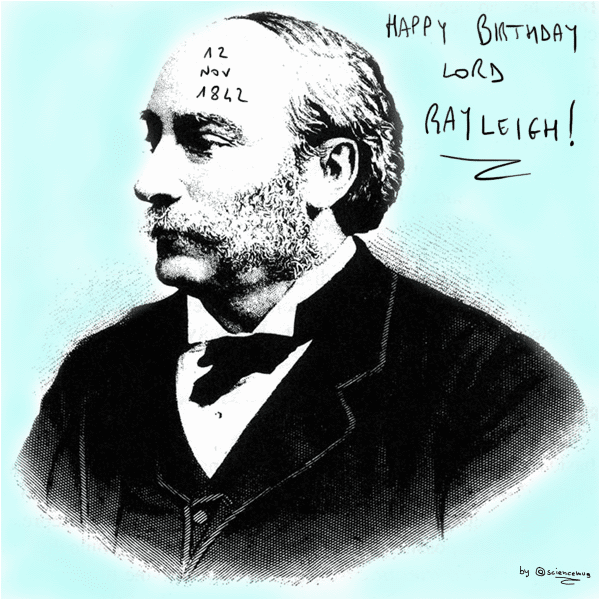 Ah, by the way, my lord Rayleigh, there, he won a Nobel Prize in 1904 for he (and this dude, Sir Ramsay) discovered the gas argon (you know, that stuff that is used in lighting and is less than 1% of the above mentioned atmosphere of yours).